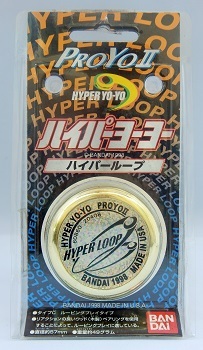 A unique and hard to find gold chromed "Bandai Hyper Yo-Yo ProYo II Special Edition" from 1999. Made by Playmaxx but rebranded for Bandai's Hyper Yo-Yo series. This yo-yo model was given as an award to 2A players in looping contests. See "Close-up, side B" picture. A similar award yo-yo was released by Yomega. The Hyper Yo-Yo Yomega Gold Fireball 99 Limited Edition.